The Danube Delta had long been on my travel list. It seemed so far removed from the other parts of Romania and a place I could go to for a relaxing holiday, work a little on my laptop, and chill out in one of the most beautiful places in Romania. One of the biggest issues I had was planning my holiday to the Delta… I just simply didn’t know how to do it and there wasn’t an abundance of information out there. 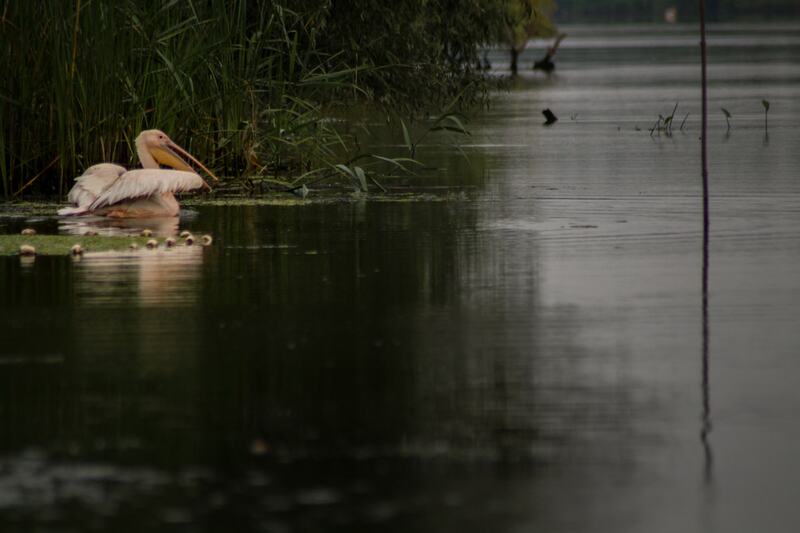 Last month, I was invited to the Danube Delta by Explore Dobrogea and that all changed. I was going to finally visit the Danube Delta and I would be able to write about my time there, inspire other travelers to visit and help them plan their travels with ease. I must say that this region blew my mind. I had no idea such a place existed within Europe. I saw the photos but until you see the Danube Delta Biosphere Reserve with your own eyes, you have no idea just how special and important this area is to Europe. It is 100% Europe’s best-kept secret. There is a neverending list of things to do in the Danube Delta, but hopefully, this will get you started… and inspire you to add it to your Romania itinerary for your next trip! Before I get into things to do in the Danube Delta, you should probably know more about what it is. It is, hands down, one of the rawest places I’ve visited in Europe. The wetlands and ecosystem reminded me of the low country back home in the southeastern United States, albeit with no crocodiles. Romania is known for its cities and forests- there are plenty of things to do in Bucharest and many nature opportunities in the mountains and forests. But wetlands and special ecosystems? Not so much. This is the end of the Danube River and is the second largest river delta in Europe next to the Volga River one… but the Danube is better preserved. The Danube Delta can be found mostly in Romania with a bit of it in Ukraine. The Delta has three channels: Chilia, Sulina, and Sfantu Gheorghe. The Chilia branch is the youngest and most vigorous and a lot of it lies within Ukraine. The Sulina branch is the central branch and its course has changed several times over history- a lot as a result of man. And the Sfantu Gheorghe branch is the southern branch and the most sparsely populated. The Danube eventually flows into the Black Sea. The Danube Delta Biosphere Reserve is actually home to one of the greatest ecosystems in the world and is a UNESCO World Heritage Site. There are even over 300 species of birds recorded in the Delta. It has the third largest biodiversity in the world next to Australia’s Great Barrier Reef and Ecuador’s Galapagos Islands, respectively. There are so many places worth visiting in the Danube Delta. I, fortunately, was able to see several of them while I was there. This is a list of my favorite places, villages, and sights that I visited in the Delta. Our stop at Mila 23 was easily one of my favorite things we did in the Danube Delta. The tiny, only accessible by boat village was colorful, relaxing, and a place I’d love to stay for a couple of weeks to get away from the hustle and bustle of everyday life. 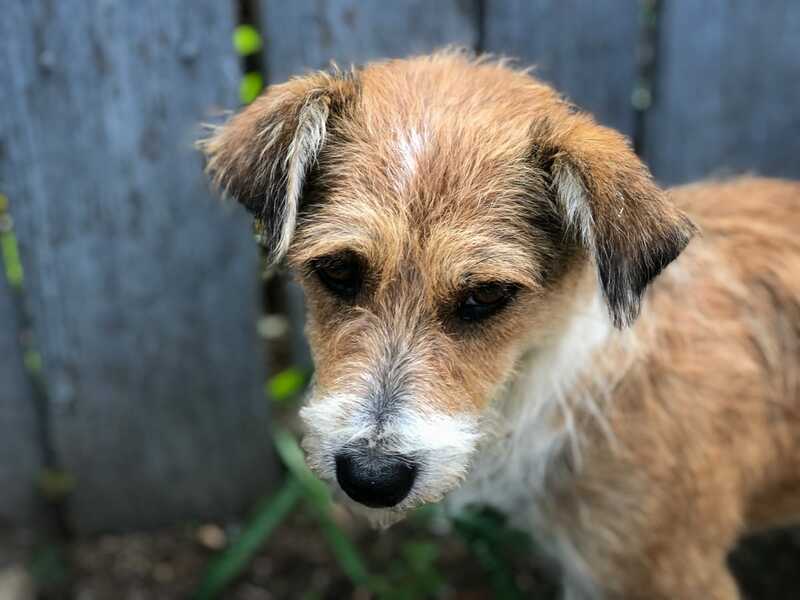 We were greeted by a dog upon arrival which basically already made it become a top contender and that same dog actually followed us around the entire village. Mila 23’s makeup is diverse, but it is mostly inhabited by the Lipoveni, descendants of Russians fleeing religious persecution in the 18th century. 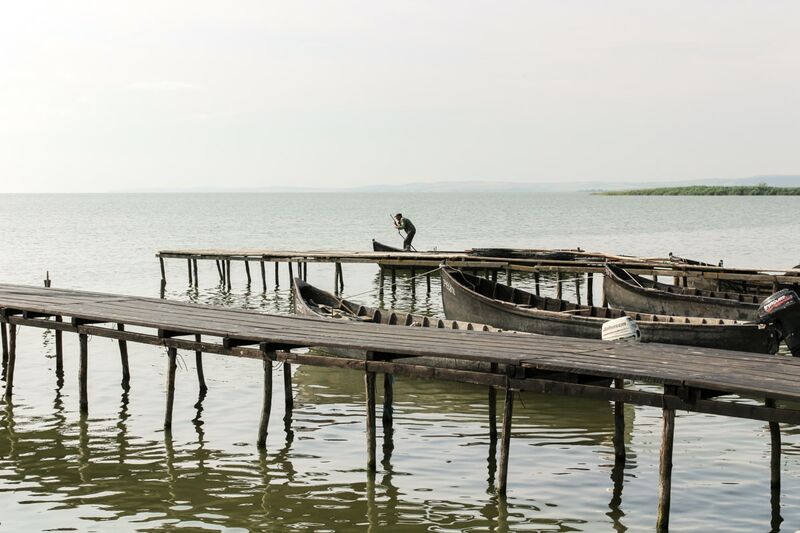 The Lipoveni were known to be superb fishermen and have a rich history and you can now find them all over the Delta. Mila 23 means ‘Mile 23‘ as the name suggests. When the village became inhabited, the Sulina Channel measured 23 miles at that point. Things have since changed but the village name has stuck. The fishing community is also known for being the home of 4-time Olympic Gold medalist, Ivan Patzaichin. He is currently the Romanian national team’s canoeing coach. Getting to Mila 23 isn’t extremely easy due to the fact that it can only be reached by boat. However, regularly scheduled boats do go out here. The tickets are sold at Tulcea’s Navrom terminal. Be sure to ask what your route to get there is as you will likely have a changeover in Crisan or somewhere else along the way. Click here to check boat schedules (only in Romanian). 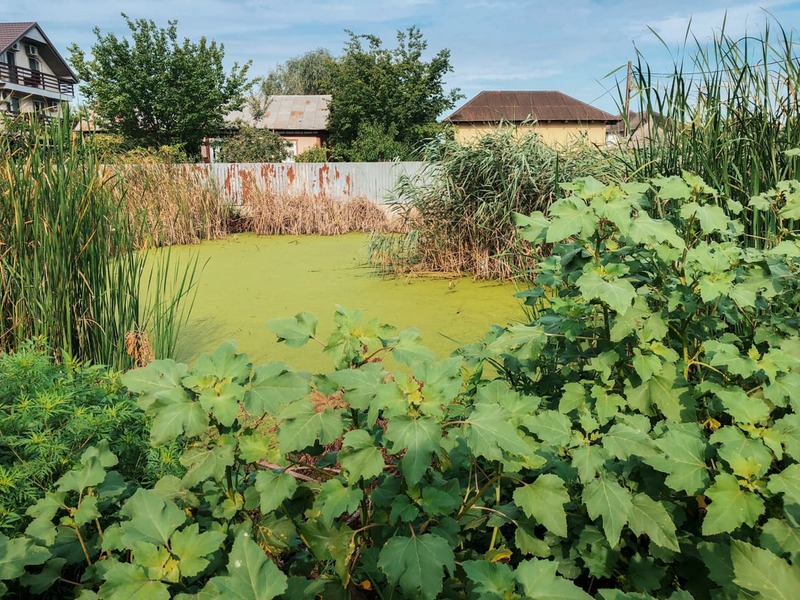 To celebrate the success of Ivan Patzaichin, you can also canoe through the Danube Delta and even take a self-guided tour to his hometown of Mila 23. Click here to find out rates and additional information. Not looking for an active holiday? 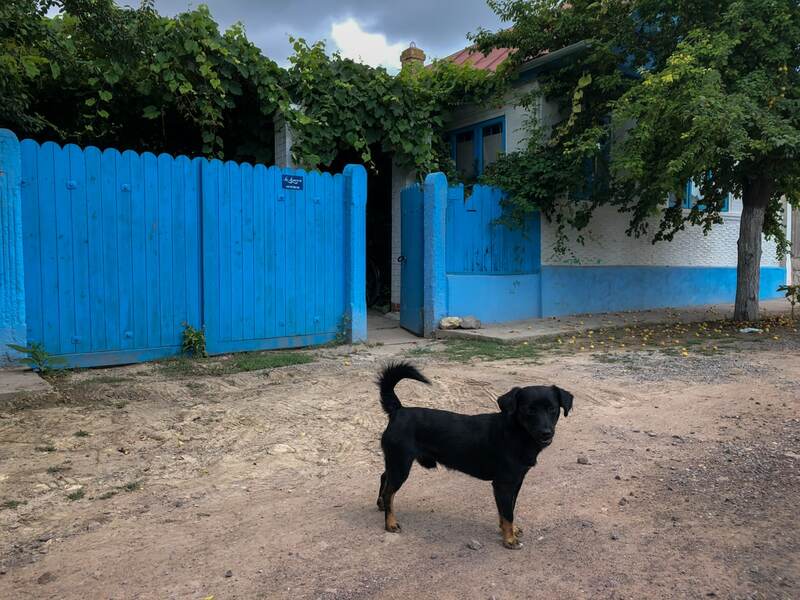 This tour starting off at Tulcea and going through a few villages in the Danube Delta, including Mila 23, may be more your cup of tea. Click here to find out rates and additional information. There are not an overabundance of properties on Mila 23 but there are enough and they should be available if booked in advance during the high season (summer!) Most are guesthouses where you’ll get a taste of the slow, island life that exists there as well as some of the delicious food! I didn’t see too many places when visiting but I did see a restaurant/cafe as well as a small shop to get basics and essentials. Click here to check properties, rates, and availability for Mila 23. I don’t think I appreciated the Letea Forest as much when I was there as I did when I left it. It was a long day and we were hungry and wanted to eat. 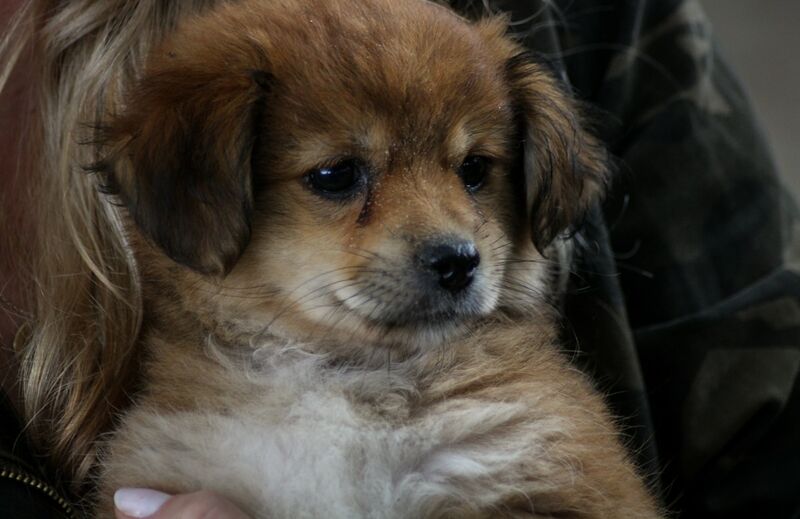 It also doesn’t help that we made friends with the cutest dog in the world apart from mine before we got to the forest and we knew we would see him after the forest, making the anticipation problematic and real. 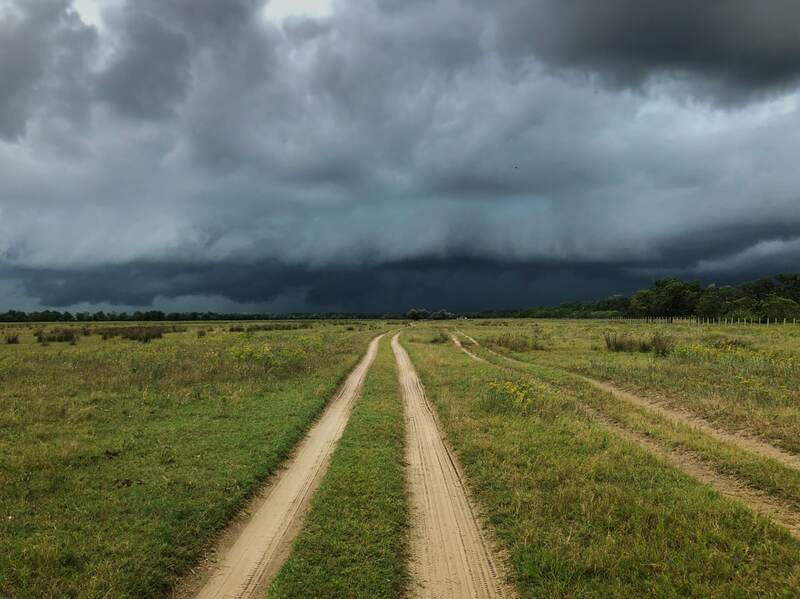 A major storm was rolling in and the mosquitoes were ruthless. But, this is a natural gem in the Danube Delta Biosphere Reserve and deserves more attention than it receives and is definitely one of the top things to do in the Danube Delta. The forest is subtropical, has sand dunes on one end of it, and the area is home to wild horses. It was really remarkable and the nature lover in me should have been living in the moment more than batting away the mosquitoes (I get bitten worse than anyone I’ve ever met in my life). This is Europe’s northernmost subtropical forest. The Letea Forest is the oldest nature reserve in the country of Romania, dating back to 1938. You are able to get to the village by boat transportation but access to the forest is prohibited without a guide or attendant as it is highly protected. I suggest booking one of the tours below to get to the Letea Forest. One of the best ways to see the Letea Forest is with a private guide and boat tour. This tour is completely private and you will also get to cruise through the channels of the Danube Delta before a coffee break in Mila 23 and then continue onto Letea Forest and Village. You will also get to meet locals in Letea and have a meal there. Click here to find out rates and additional information. If you’re looking for something more affordable and you don’t mind traveling to the Letea Forest in a group, then this tour may be better suited for you. 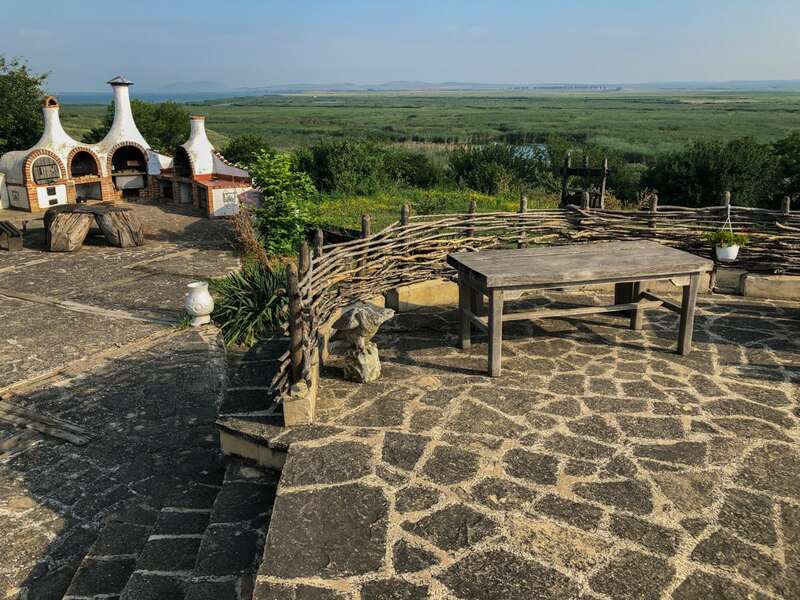 You will still meet in Tulcea and you will have a bit of time in the Letea Forest on a safari vehicle before stopping for lunch in Letea Village. After, you’ll stop by Mila 23 for a short visit. Click here to find out rates and additional information. It is better to have a tour booked for visiting the forest, but the village itself can be visited independently. There are not many accommodation options in the village, but some do exist in nearby villages. Click here to check out properties, rates, and availability for places near Letea Forest and Village. Enisala was the place we were based when we were in the Danube Delta. Located in the Sarachioi commune, this small village is known for the Enisala Fortress which majestically looks over the entire area. It is the only medieval fortress in Dobrogea, Romania. There is not an overabundance of things to do in Enisala itself, but we stayed at the Enisala Safari Village and the views there were really spectacular. Many of my group went to the Enisala Fortress in the evenings to watch the sunset but I usually chilled out in the evenings as I was tired from the day and had to prep for a trip I was taking after the Danube Delta one. Hence the photo below being one of the Safari Village and not the actual Fortress. Nevertheless, heading to the Enisala Fortress is one of the top things to do in the Danube Delta for history lovers (or those wanting an overlook of the area). Honestly, Enisala isn’t the easiest place to reach without a private car. The best way to get there is to take a bus to Sarichioi or Babadag and then a taxi or local bus to Enisala. There are not actually any tours that go to the Enisala Fortress by itself at the moment. You can drive privately there or take a tour where it is included. I highly suggest this tour by Explore Dobrogea which will make a stop at the Enisala Fortress along with many other things! Click here to inquire about the tour. We stayed at the Enisala Safari Village when there. While the views were out of this world, I wouldn’t necessarily recommend staying there. Some rooms didn’t have working air conditioning, some rooms didn’t have working lights (me! ), and the food was less than desirable. But… the views were truly incredible. There is a fair amount of properties located near Enisala, however, and this link gives options (just avoid the first). Click to check out rates, properties, and availability for places to stay near Enisala. The village of Sarichioi was one of the first stops on our list when in the Danube Delta. It is known for its idyllic location and is situated right on Lake Razim, an immense freshwater lagoon on the Black Sea. It is also known for its large Lipovan community that inhabits the place. When we arrived, we went down to the water and snapped some photos. I was in awe of how still the water was and how fishermen just went about their daily routine in such a remote and lulling manner. The local homes had reed rooves and the people were smiling and pleasant to be around. There was also a Russian Orthodox church in the city with brilliant gold domes that made me feel like I was in the places that I am usually frequenting on the road, like Ukraine or Belarus. Either way, I found that paying a visit to Sarichioi was one of the best things to do in the Danube Delta and the experience was as culturally fascinating as it was naturally beautiful. Sarichioi is easier to get to than some of the aforementioned places. You can take a bus to the village from Tulcea three times daily and can also easily reach the place by private car or transfer. Click here to see the public bus schedule. Explore Dobrogea specializes in tours of the Danube Delta as well as bespoke itineraries for those looking for a more customized experience. 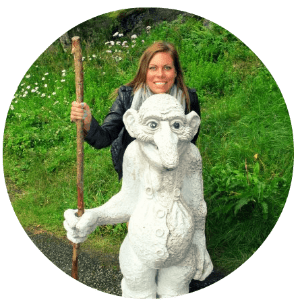 They offer a tour that takes you to Sarichioi and you will even have the chance to stay overnight and learn more about the area and the Lipovans that inhabit the village. Click here to inquire about the tour. There is currently a guesthouse being built in Sarichioi that I am going to be stoked to recommend upon completion. I visited it when there (still under construction) and received an explanation of the concept and idea behind it. But, it is not completed just yet. Fortunately, there are other options for places to stay in Sarichioi and the surrounding area. Click here to check out rates, properties, and availability for places in Sarichioi and nearby. 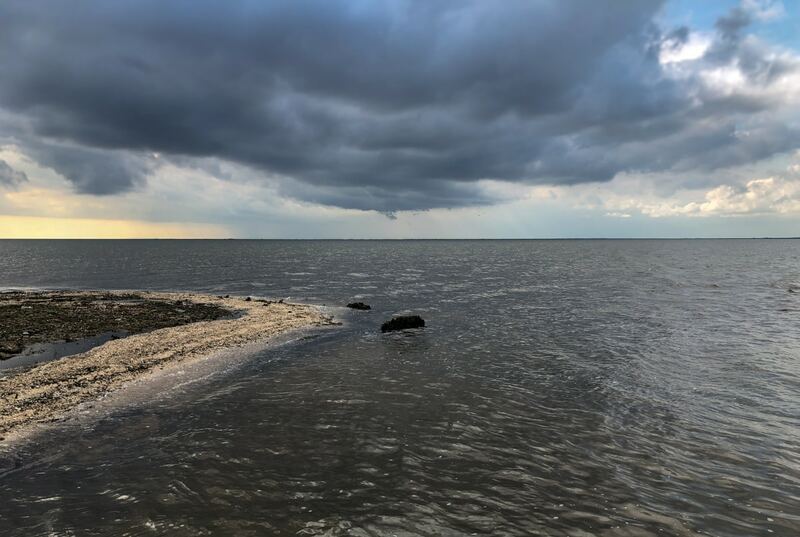 Europe’s newest piece of land, Sacalin Island, is an island located in the Black Sea really close to the Danube Delta’s Sfantu Gheorghe branch. 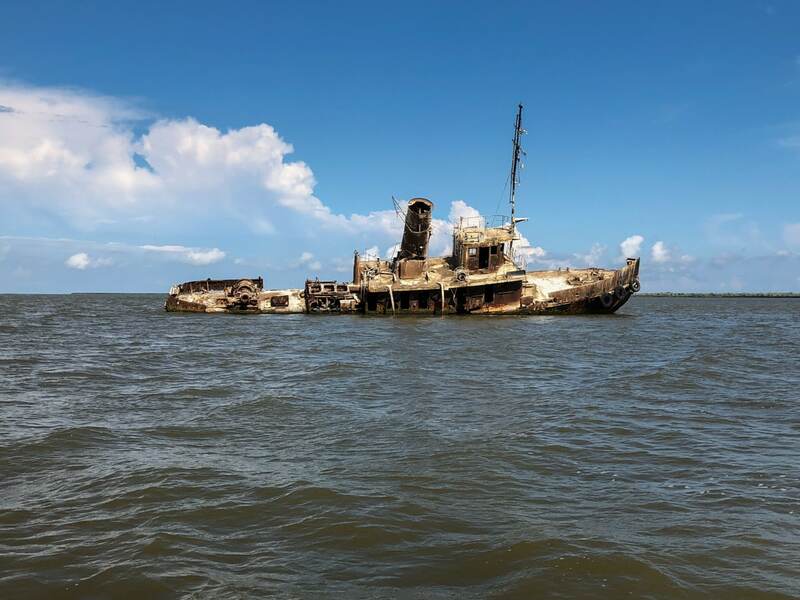 We got to go out and visit it on our last days in the Delta and it was definitely one of my favorite excursions while there (even though I never left the boat because I wasn’t keen on getting my pants wet). The ride out to the island was one of the best things about it- we passed a shipwreck as well as insanely gorgeous scenery and temperamental skies as a storm started rolling in. I absolutely recommend Sacalin Island to nature lovers visiting the Danube Delta. There are also several birds that have decided to call this island home. Naturally, it is only accessible by boat and is uninhabited. The easiest way to get to Sacalin Island as a tourist is by booking a tour. The land is protected and getting there is not a viable option without having something arranged. 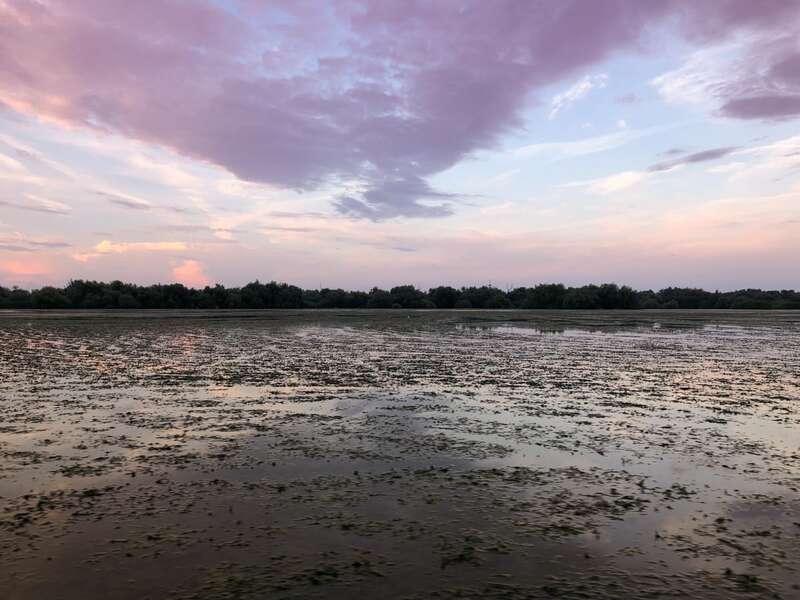 The tour I recommend is this one by Explore Dobrogea that includes Sacalin Island on their list of things to do in the Danube Delta and itinerary. 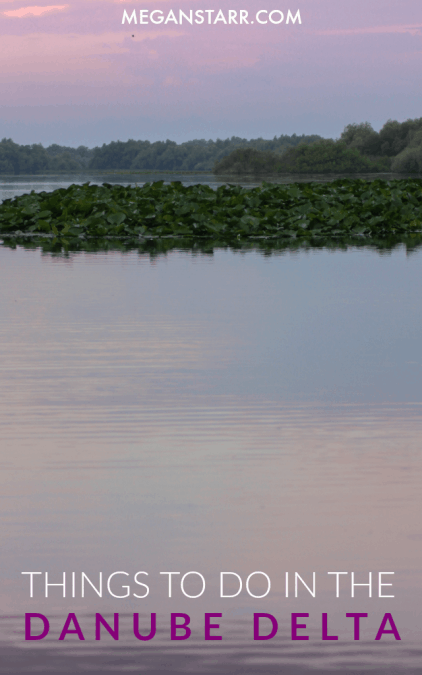 This tour focuses on the Southern Danube Delta. Click here to inquire about the tour. The best place to stay in order to get to Sacalin Island is in Sfantu Gheorghe. There is actually quite a bit to do in Sfantu Gheorghe and it was one of my favorite places I visited in the Danube Delta. Click here to check out rates, properties, and availability for places to stay in Sfantu Gheorghe. The village of Sfantu Gheorghe has a population of almost 800 people and is a fishing village in the southern part of the Danube Delta. The reason I liked the village so much is that it had life and personality. Other villages weren’t void of it, but because there was a fairly sizeable population living in Sfantu Gheorghe, it just had a bit more life. I also really loved the Green Village, an adventure and wildlife resort located right on the water in Sfantu Gheorghe. A couple of my friends traveling with me enjoyed a beer with me in a gazebo right along the water and it was a great time. I really can’t wait to go back and stay at Green Village for a few days. Click here to see rates and availability for Green Village in Sfantu Gheorghe. Sfantu Gheorghe is accessible by boat, but not too frequently. From Tulcea, you can reach it a few times a week. You can see the schedule here. It is recommended to visit Sfantu Gheorghe by tour or by booking a stay at the Green Village where they will arrange transportation for you. 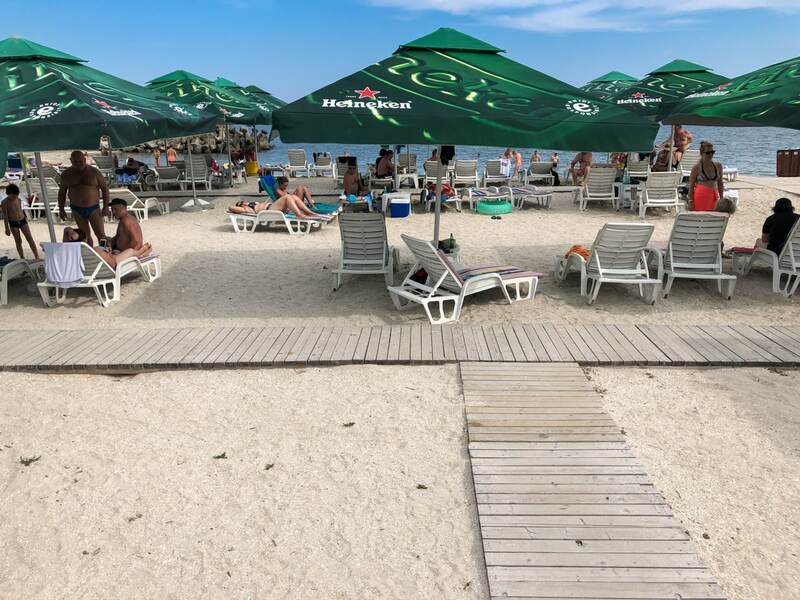 Like Sacalin Island, the best tour to take to spend some time in the southern part of the Danube Delta in Sfantu Gheorghe is the one by Explore Dobrogea. You can inquire about the tour here. I can highly recommend Green Village when in Sfantu Gheorghe. The property is spacious, insanely clean and well-kept, and there is a delicious restaurant on site, along with bars, activities, and an abundance of things to do. 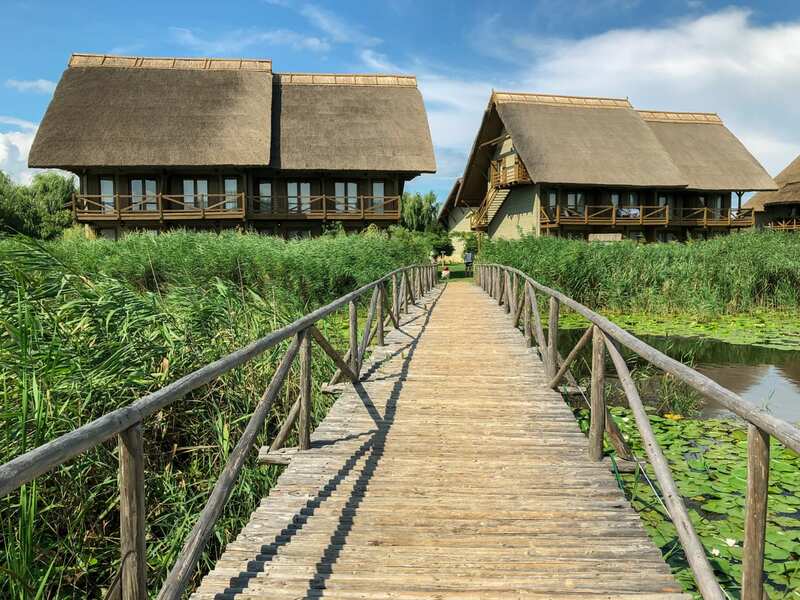 I will definitely be staying there next time I am in the Danube Delta. You can check out rates and availability at Green Village here. If you don’t have the option to stay at Green Village, there are other types of accommodation available in Sfantu Gheorghe. You can check rates, properties, and availability by clicking here. To be frank, the Danube Delta is not a fast travel kind of place. Getting places can be cumbersome and the place just takes life at a slower pace… and that is the best thing about the Delta. But, after all of the time spent on a boat and on excursions, one of the best things to do in the Danube Delta is RELAX! The ideal place to do this is at Gura Portitei, a resort village on the Black Sea. We went to Gura Portitei on our last day and unfortunately, I worked while I was there along with some other bloggers. We were behind on work and our days had been tiring prior to that, so instead of sunbathing and playing in the sea, we sat with our laptops at a table. At first, I definitely enjoyed a beachside beer though. There is a restaurant that served an absolutely delicious pizza and had some live music and dancing to keep us entertained. The place was bumping and it was one of my favorite days on the trip just for the sake of how chill it was. I highly recommend spending a day at Gura Portitei if you are looking for more things to do in the Danube Delta. You can reach Gura Portitei by private boat or by getting to Jurilovca village from Tulcea and taking the boat from there. Boats leave a few times a day. You can also stay overnight there. The best place to stay in Gura Portitei is the resort itself. To view more about the property, click here. If you’re not wanting to stay at Gura Portitei, you can always stay in Jurilovca and take the boat over. This is a more popular option as more accommodation options exist in Jurilovca. Click here to check properties, rates, and availability in Jurilovca. I feel so bad that I didn’t get to spend more time in Tulcea. Tulcea is the main and largest city in the Danube Delta and a great base to plan your holiday to the Danube Delta Biosphere Reserve around. I spent a short amount of time there my last couple of days as I went to a cafe there and we had a meeting in an office there- but that it is. We also got to go up to the Independence Monument where we had a view over the entire city and beyond. I hope to go back and explore more. Discovering Tulcea is definitely on my list of things to do in the Danube Delta next time I’m there. Getting to Tulcea is easier than anywhere else I have listed here. Simply because it is a larger city! You can reach it easily by bus from other cities in Romania or by rail. 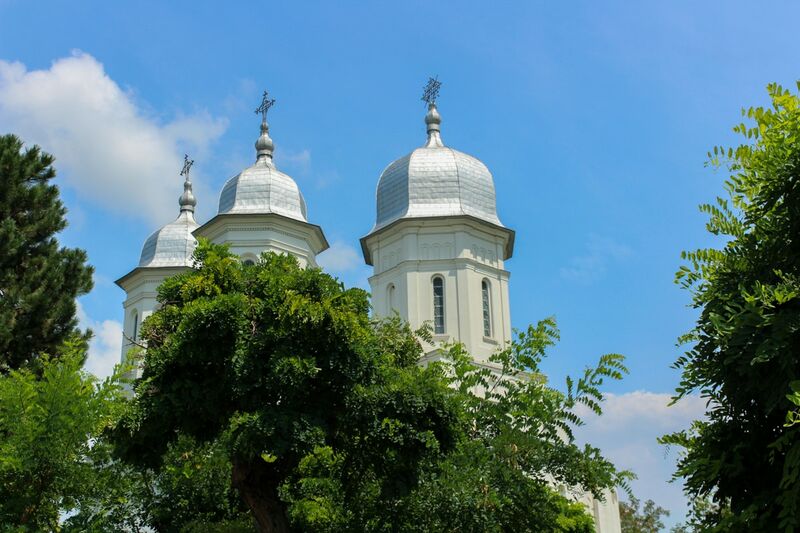 You can easily peruse Tulcea independently, but if you want to include your visit to Tulcea in a tour of Romania as a whole, you have a couple of options. 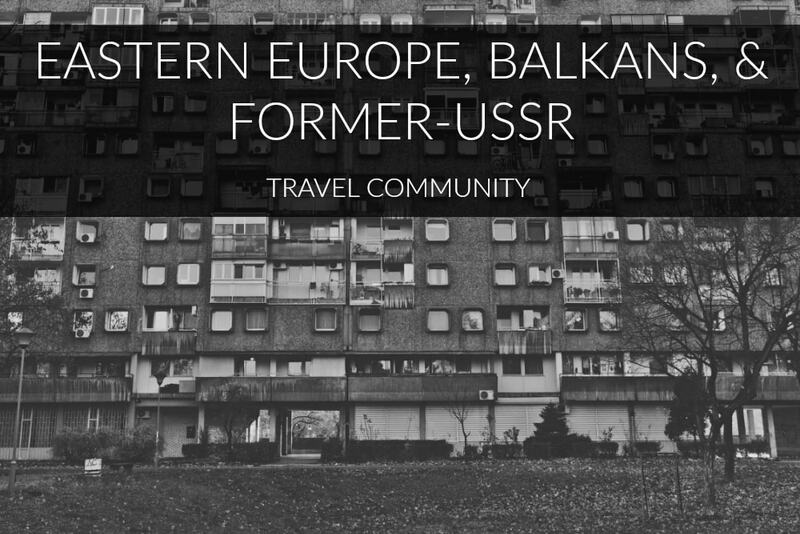 The first tour is one that tackles the best of Romania and starts off in Bucharest. You’ll see an extensive amount of the country in those 12 days and a trip to Tulcea and the Danube Delta is included. Click here to find out rates and additional information. 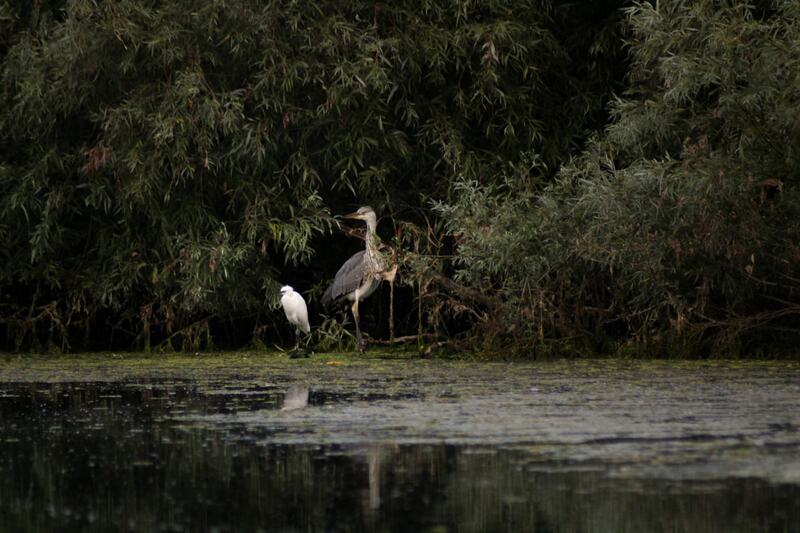 As I mentioned at the beginning of this post, the Danube Delta is a UNESCO World Heritage Site! And, this tour visits all of the UNESCO sites in Romania… which includes a trip to Tulcea and spending some time in the Danube Delta. The tour lasts 11 days and is highly recommended for those loving historical and natural sites. Click here to find out rates and additional information. Most people that travel to the Danube Delta make Tulcea their base for most of their trip. There are more accommodation options in Tulcea than anywhere else, naturally, as it is a larger city. While I stayed in Enisala for this trip, you can take a peek and see what options are desirable to you in Tulcea. 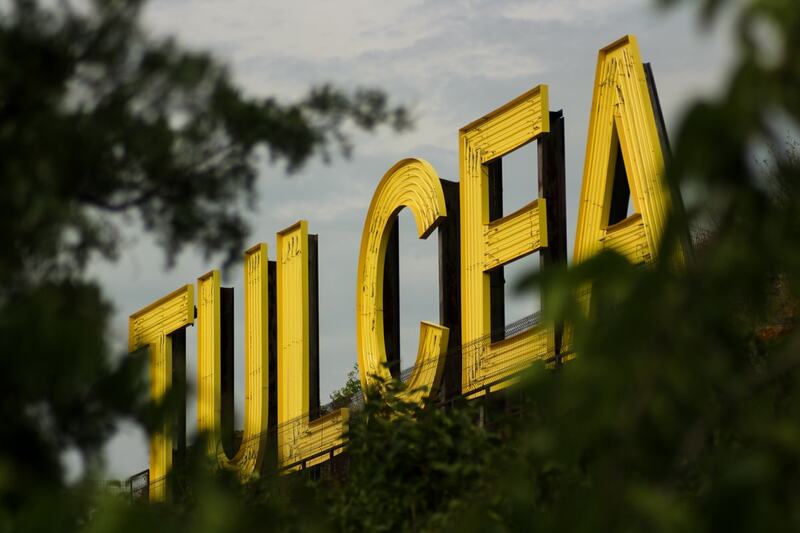 Click here to check rates, properties, and availability for places to stay in Tulcea. The amount of activities that exist in the Danube Delta is mindblowing. And the number continues to grow as the region garners more and more tourism. While I am only listing a couple of generic things to do in the Danube Delta, there truly is something for everyone there- from learning more about the Lipovans to visiting monasteries to seeing historical ruins. But, these two were my absolute favorites. Why? I love animals and I also love to drink. The Danube Delta catered to both. People come from all over the world to the Delta to do some birdwatching. In fact, it is probably one of the best places I have been anywhere in the world for birdwatching. We set out early in the morning on a boat on the Delta to see the sunrise and watch the birds start their day. We saw so many pelicans (they have moved up a few slots on my list of favorite animals) and we even got to see an eagle or two that day. Bird lovers will be in heaven here. Because this area is protected and a significant bird habitat, drones are illegal. We had permission to fly one from the tourism board and government for the project, but please leave your drones at home and respect the birds’ environment while there. Three Days With a Private Guide: This birdwatching tour is private and takes you from Bucharest into the Danube Delta for three days with a guide. You will have the chance to see grebes, cormorants, pelicans, bitterns, egrets, storks, glossy ibises, common spoonbills, American flamingos, swans, wigeons, and pochards (pending they decide to make an appearance, of course). All transport, meals, and accommodation are included in the price. Click here for rates, availability, and additional tour information. One Day With a Private Guide: This tour is also private, but only one day instead of three. You will be picked up in Bucharest and taken into the Danube Delta. You will have the chance to see an abundance of bird wildlife while there. Click here for rates, availability, and additional tour information. Birdwatching in the Southern Danube Delta: This tour focuses on the southern Danube Delta and lasts for 5 days and 4 nights. You will also get some cultural experiences and have the chance to stay at a traditional guesthouse in Sarichioi. You’ll have transport arranged in Bucharest (or Constanta upon request) and a guide once up in the Delta. Click here for rates, availability, and additional tour information. One of the greatest things to do in the Danube Delta is to drink wine! I actually had no idea that the region was home to some delicious and unique wineries, but it is. We stopped by Macin Winery and got to enjoy theirs alongside some really tasty snacks and food. It was definitely one of the highlights of my trip and really showcased the Danube Delta’s superb gastronomy. The monasteries you will visit are Celic-Dere, Saon, and Cocos- the Paleochristian Church from Niculitel. The best way to experience the wine and monasteries in the Danube Delta is through an organized tour as they are not always easy to reach privately. This 6 days / 5 nights tour is ideal to learn about wine, monasteries, and the culture of the locals. Click here to find out additional information. The Danube Delta is easily my new favorite region in Romania. I never fully connected with other regions as I had hoped for one reason or another. I’ve been to Transylvania and I have even lived in Timisoara. But, there was just something really special about the Delta that lured me in. Some of it looked like where I am from and the slow-paced life really relaxed me, which is not easy to do as I am a pretty high-strung person. If you’re looking to create your own itinerary for the Danube Delta, please get in touch with Explore Dobrogea and they will customize something very fitting to your travel desires. ** I was a guest of Explore Dobrogea while visiting Dobrogea and the Danube Delta. All opinions and dog photos are my own. Thank you so much! What an undiscovered piece of heaven! Very nice blog! I am very glad to read your blog. It’s really amazing. I am so impressed about this post! I want to say “Thank you” and plese note that I was born and I still leave in Danube Delta.